Different solution existed to bridge the gap between the traditional phone and the world of VoIP communication through Skype. To mention a few, the headset / microphone, the USB “phone”, the wireless phone or even a polycom. But the common aspect for all of these is that each require a computer, with the user logged into his Skype account… and the more advanced options are Windows only. 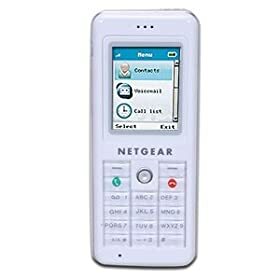 But now, with the Skype WiFi phone from Netgear (SPH101), you can make Skype phone calls without any computer. All you need is an 802.11g network connection (it should also be compatible with an 11b network). And it works great! The out of the box experience is really nice. You get a phone that is about the size of a normal mobile phone, a charger with a USB connector (and it is small enough for travelers) as well as a small instructions booklet and a CD. The one comment about the CD is that this is only for Windows, e.g. I have no idea what is on it… lucky me that it is not required to use the phone. After charging the phone for a few minutes, I already turned it on. You go through a simple step-by-step process to connect to a WiFi network and then to log into your Skype account… et voilà, ready to make a phone call. It takes 20 to 30 seconds to download the contact list. It is not stored on the phone, but downloaded every time. The sound quality is good overall, especially when I tested it with someone on the same LAN… no difference with the Skype software on my computer using a basic USB phone. Straight-forward process to configure the WiFi access and Skype access. Works with WEP 128-bit and WPA-PSK and can be configured to connect to hidden SSIDs. The size is right (as small as a modern cell phone) and the sound quality is good, at least from the tests I’ve done so far. USB chargeable… this seems to be a requirement for all little devices and it is really nice to only carry a few chargers when traveling. Take your laptop, its power cable and a USB cable to charge your Skype phone. It only becomes problematic when you have more devices than you have USB ports on your laptop… but that’s the subject of another blog entry. No Instant messaging support. When you are logged into Skype using this phone, people get the message that you use a client that is to old to support IM. Netgear, please include T9 support for typing and add IM support. Until that’s done, I can understand that instant messaging would be really tricky (except for the SMS junkies out there). I still would love to get IM support on my phone for simple messages… well, for the time being, I’ve noted in my mood message that I only accept voice communication. I must be doing something wrong, but I am unable to get the SPH101 to automatically connect to a preferred network when it starts up… When the device searches for an available WiFi connection, it doesn’t seem to look for the preferred ones. This is a little problematic as my SSID is hidden. Well, only a few extra clicks at start-up to get it going. Battery life seems very short, but then again, I haven’t tested it enough to give it a thorough review. One thing strange is that the phone just died on me, without any annoying beeping warning that the battery was running low. Please, please, at least warn me when I only have a few minutes of battery left, so that I can tell the person I talk to that the connection might be broken shortly. You need a WiFi access that doesn’t require web-login. This means you won’t be able to use it at most public hotspots (hotels, airports, coffees, …) as there is no web browser to go through the login process. As mentioned before, it is really cool for a version 1.0 of a product… and I can only hope that some of the cons will be fixed with a revision of the firmware. My next challenge… to get IT to allow me to use it at work.